Bascule bridges. These bridges pivot from one side of the river's shore. They usually have a large counter-weight which balances the bridge while motors move the bridge open and closed. Some counter-weights are enormous, like those on the New York Central's River Rouge bridge in southwest Detroit. Some variations on this type of bridge include Double Bascule spans, which open from both sides and meet in the middle. Swing bridges. These bridges are like a bicycle tire laid on its side. They have an axle in the middle of the span which is placed in the middle of the river. The bridge rotates, like a tire does on its axle (except horizontally). Like other bridges, swing bridges are often connected to fixed spans with the swing portion used for the passage of ships. An example of a swing bridge is the Delray Connecting Jefferson Avenue Swing Bridge over the Rouge River in southwest Detroit (near Jefferson Avenue and Dearborn Avenue). 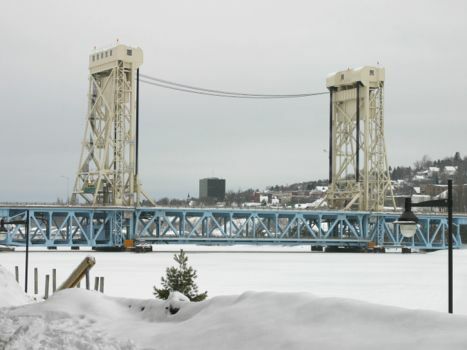 Lift bridges. These bridges work like an elevator with a horizontal mount on each side. The bridge is lifted up and down, similar to how an elevator works. An example of this type of bridge is the road/railroad bridge over the Portage River Canal between Houghton and Hancock in Michigan's Keweenaw Peninsula. For detailed information on each bridge, click on a link at the left. The information is divided into five sections. Active. The first section is for movable bridges that are active - currently in use by a railroad. Fixed in Place. The second section is for railroad bridges which are still used by railroads, but have had their motors removed or are welded shut. Repurposed. The third section are bridges which have been removed from railroad service but have been repurposed for another use, usually vehicles or pedestrians/trails. Removed. The fourth section are bridges which have been completely removed and are gone. Other. The fifth section is for bridges or trestles which have never been movable bridges and are interesting and notable for some special reason - such as purpose, size, or view. This section is limited to bridges of unique construction, length or function which make them stand out as notable.